This is an update on the number of significant plan changes we’ve caused as of the end of Nov 2016. Someone tells us that 80,000 Hours caused them to change the career path they intend to pursue, in a way that they think increases their lifetime impact. More on what counts as a significant plan change here. 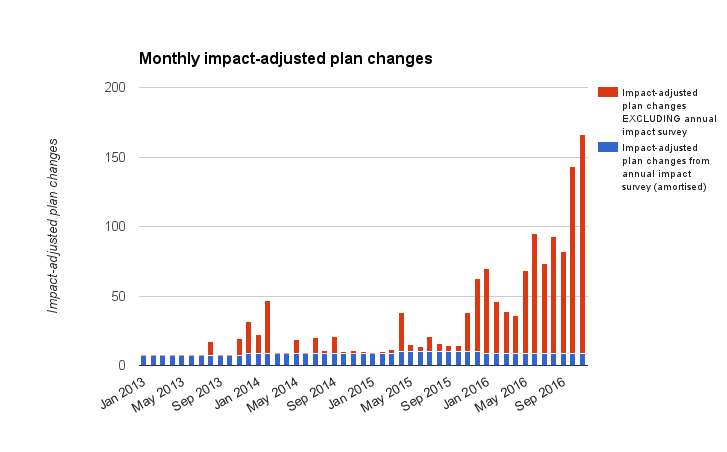 Our total number of plan changes as of the end of Nov 2016 is 1,854, and after impact-adjusting these it’s 1,504.8. 3 How did we find out about the plan changes? 4.1 What did the changes consist of? 4.2 How many people took the Giving What We Can pledge due to 80,000 Hours? 4.3 Which causes are people planning to work on? 4.4 How involved in the effective altruism community are people who make plan changes? 4.5 How did they first hear about 80,000 Hours? 5 What caused the plan changes? 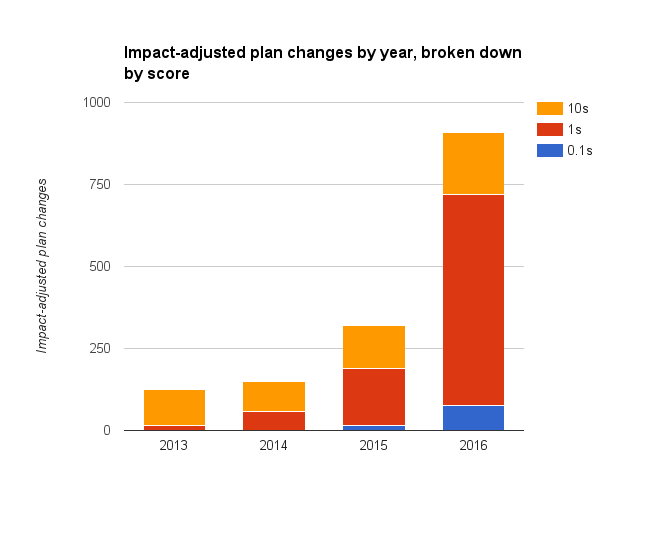 In October 2015, we started rating plan changes with a value of 0.1, 1 or 10 based on our estimate of their counterfactual impact, in order to track the quality of plan changes over time. Read more. Note that we only started collecting plan changes in 2013, but started outreach in 2011. This means the 2013 figures reflect three years of work rather than one, so our growth from 2013 to 2014 was better than it looks from these charts. Also, the figures for 2016 don’t include December, so our year-on-year growth rates will be somewhat higher once all of 2016 is included. Most of our growth has been driven by the 1s. This is because (as is shown below) growth has largely been driven by (i) workshops (ii) our online tools and the on-going impact survey (benefiting from higher web traffic) and (iii) more people taking the Giving What We Can pledge. These sources tend to produce 1s rather than 10s, especially in the short-term. However, we think about 10% of these 1s will become 10s over the coming years. It’s hard to become a 10 right away because it requires a big shift. How did we find out about the plan changes? Impact survey – we have a survey on our website which about 5-10 people fill out per week. Once a year we also send the survey out to everyone on our newsletter — we call this our ‘annual impact survey’. 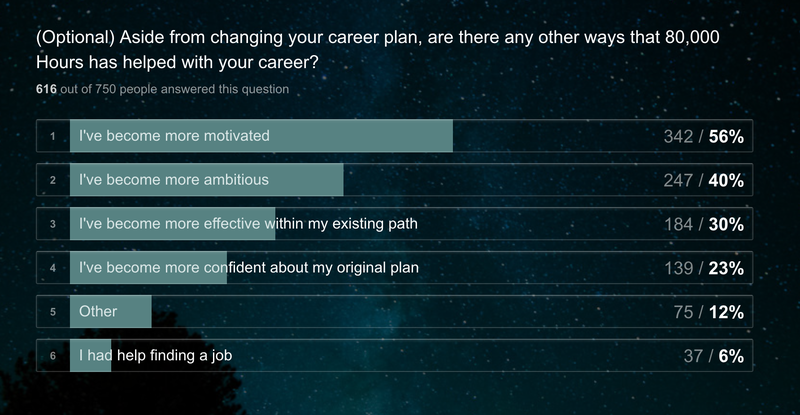 Online tools – our tools survey users on whether 80,000 Hours caused them to change their career plans. Workshops and coaching – all workshop attendees and people we coach are asked to fill out a feedback form which asks them if they changed their plans. Manual correspondence – we email a small fraction of our users to ask if they changed their careers plans due to us. From Giving What We Can – we email Giving What We Can members who say they heard of GWWC through 80,000 Hours to ask whether they took the pledge due to us. You can see some examples of plan changes in our annual review (forthcoming). There are summary statistics below. In October 2016 we added new questions to our plan change surveys, asking users for more information. One new multiple choice question we now ask is What did the change consist of? 446 people who made significant plan changes have answered this question so far (out of a total 1,414 people who made a plan change in 2016). What did plan changes scored “10” switch into? What did plan changes scored “1” switch into? 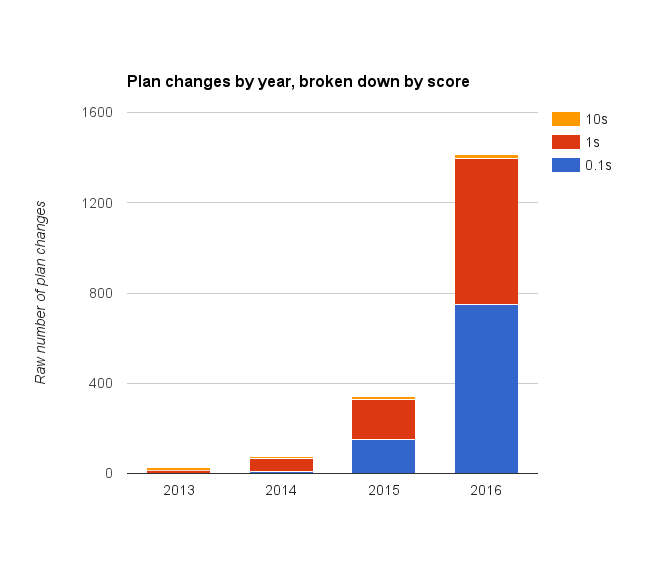 We selected a random sample of 30 plan changes scored as 1s in 2016, and categorised them by what they now intend to do. What did plan changes scored “0.1” switch into? If you’re interested in donating to 80,000 Hours, we can give more examples of plan changes. Please fill out this form and we’ll be in touch. How many people took the Giving What We Can pledge due to 80,000 Hours? In 2016 we tracked 115 people who took the Giving What We Can pledge due to 80,000 Hours. 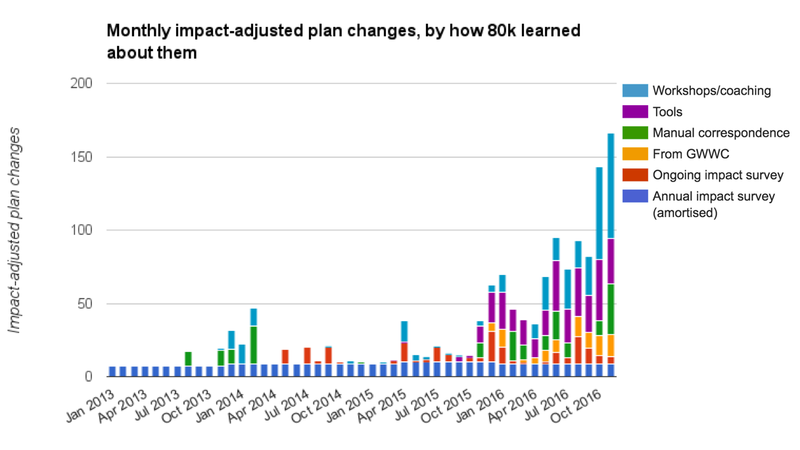 This is 8% of our plan changes for the year, and 13% of our impact-adjusted plan changes. We track this figure by emailing people who take the pledge and say that they first heard about Giving What We Can through 80,000 Hours, and ask them how likely it is that they would have taken the pledge if 80,000 Hours didn’t exist. We also track people who say in our impact surveys that they now intend to take the pledge due to 80,000 Hours, and who then become members. Which causes are people planning to work on? Another new question we added in October 2016 is: Which global problem or cause are you planning to work on with your career? So roughly 15% of the plan changes (based on the sample) are switching into our top priority areas. How involved in the effective altruism community are people who make plan changes? How did they first hear about 80,000 Hours? 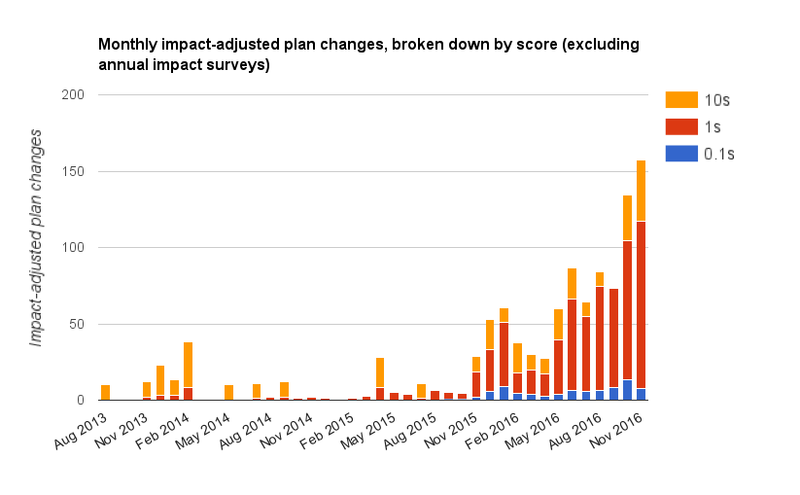 To sum up the main sources for the impact-adjusted plan changes: 30% came from word-of-mouth, 31% from the effective altruism community, and 21% from online outreach. What caused the plan changes? Compared with previous years, plan changes caused by online content and workshops have gone up, and the percentage of plan changes caused by our community and coaching have gone down. This is in line with our expectations because we spent 2016 focused on improving our online content and delivering workshops, and didn’t do much coaching. As can be seen, most of our growth in 2016 was driven by plan changes caused by online content and by workshops. 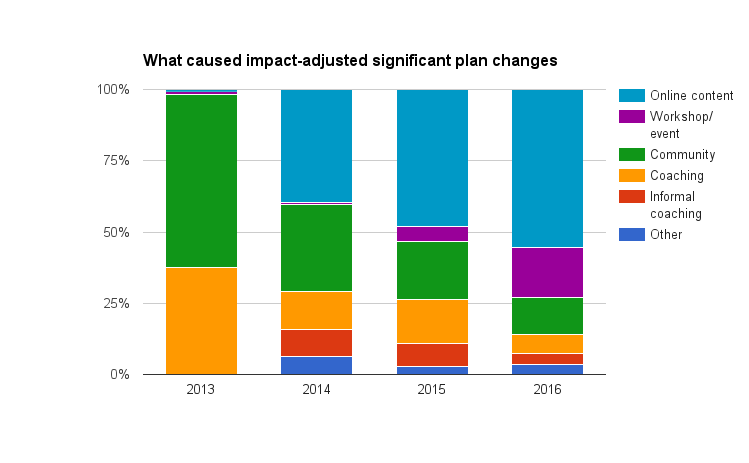 In our previous report the number of plan changes for 2015 are reported as slightly higher (326.9 vs 320). 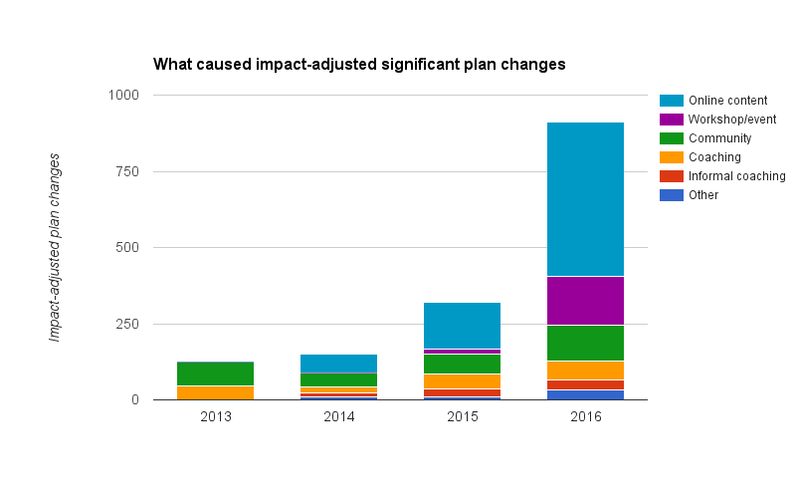 This difference is due to people who made plan changes in 2015 making subsequent plan changes in 2016 with a higher impact adjusted value, meaning they are recorded in 2016 instead, and due to disconfirming 2015 plan changes in light of new information. Also note that our cost figures are preliminary estimates. Our UK accounts with CEA UK have been audited through the end of June 2015 and the US accounts with CEA USA through the end of Dec 2015. But costs after that time will be subject to revisions.